I’ve made this successfully with home-made and with pre-made polenta before. The former was unsurprisingly the best but I certainly wouldn’t turn my nose up at the latter on a cold, wet February day. Wash the spinach then add (wet) to a hot pan. Cover and shake over the heat until the spinach has completely wilted. Drain and squeeze all of the moisture out of the spinach. Chop roughly. Add a drizzle of olive oil or butter to the hot pan along with the garlic and chopped spinach. Cook over a med-high heat for a minute or so to cook through the garlic and dry out the spinach thoroughly. Remove from the heat. In a shallow oven proof dish, add a layer of polenta followed by the spinach then the tomato sauce and the mozzarella. Add one more layer of polenta and top with the parmesan and a sprinkling of pepper. Bake in a 190 oC oven for 40 minutes until golden and bubbling. Polenta is very popular in Dalmatia, too. Try polenta with yoghurt for a very simple but refreshing meal. Most commonly, we have it as an accompaniment to a fish stew. Now that you’ve reminded me, I’ll have to make it soon! I have never really fancied polenta, but I am seeing it in a whole new light now. I wouldn’t mind trying this. Mmm, that does look good. 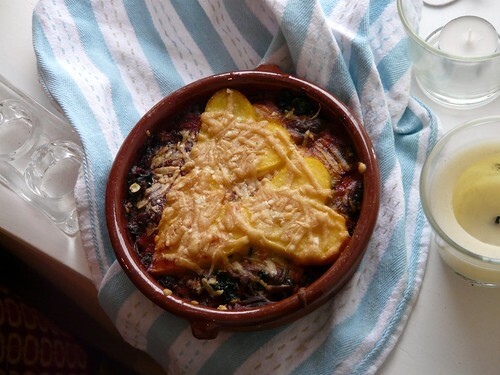 Hi Wendy, good to have discovered your blog and good to see someone elese from Scotland blogging in an area close to my heart:) r.
I love polenta served in many ways–this is a new one for me. I would like to convey my passion for your generosity in support of folks that must have help on that concern. Your real commitment to getting the message all over had been astonishingly useful and have always helped guys and women like me to get to their goals. Your amazing helpful recommendations means a great deal to me and a whole lot more to my office workers. Best wishes; from all of us.